Not every question was compiled - as noted, we only selected the top 8 questions as submitted by the community, plus 2 pre-set questions from us. Though one of the backups was adapted via a suggestion. As a candidate, your job is simple - post an answer to this question, citing each of the questions and then post your answer to each question given in that same answer. For your convenience, I will include all of the questions in quote format with a break in between each, suitable for you to insert your answers. Just copy the whole thing after the first set of three dashes. Please consider putting your name at the top of your post so that readers will know who you are before they finish reading everything you have written, and also including a link to your answer on your nomination post. What would you do if someone opposes a decision you've made? For example, opposition to removing some comments, closing/reopening/deleting a post, etc. Such opposition may come from direct comments or votes to reopen a question closed by a mod, etc. Most users here have multiple commitments. And likely, those commitments aren't going to go away if you are elected to be a moderator on MSE. Can you provide any assurance that you'll make the time, as needed, to moderate on MSE? This may only amount to an hour each day, consistently (perhaps more on some days, and less on others). In any case, how can you assure us you're not biting off more than you can chew? This is a question to those candidates who do not have the Deputy badge (which is given for 80 helpful flags). Dealing with flags is a big part of moderation. How do you think that your lack of experience is going to affect your handling of the flags? And how do you expect to compensate for it (at first, of course)? I was never suspended, on this site or anywhere in the SE network, including MathOverflow (where my account was deleted1 only due to my explicit request, and I was in good standing on the site). No, but depending on the nature of the problem I might be able to help them in other ways and would try to do so. I do not at all intend to enable cheating, but there could be problems unrelated to cheating. Disassociating a post from a profile in certain scenarios may also be of help to users getting worried about how a post might reflect on them. Merges can also be helpful at times, and I recall a precedent on this site where a judicious merge allowed to address conflicting concerns, the answers could be preserved while the question could be removed without much loss. In short, I would strive to preserve the valuable content while still trying to address the concerns of the poster (within reasonable limits), via editing, redacting revisions, disassociating, or merging. The rules of conduct of the site apply to everybody. Being good at mathematics does not confer the liberty to behave poorly. This notwithstanding I feel it is important to look at such things in a relative way, too. If a user is highly active each and every day and gets into a conflict once a months then this is not the same as a user posting twice a month and also getting into some conflict each months. The type of activity the user engages in should also be factored in. A user that engages in community moderation is more likely to get into conflicts than a user that just answers questions. By analogy, I am pretty certain that most waiters break more glasses than I. Of course not because they are more clumsy than I handling glasses, but just because they handle way more glasses than I and do this in more difficult situations. The above maybe answers a different question than intended, so let me also so what I would do. If I notice a pattern of behavior that I find problematic, I might first just inject a comment here or there, more low-profile just like some advice from one user to the other trying to diffuse the conflict and hoping they pick up they need to change. If this fails, I'd start with an invite to a mod-only chat, first, trying to understand why the user even behaves in the way they do. The motives might not always the same, some might not be able to control their temper and even realize this, others might think in a misguided but rational way that their approach is efficient. Both are a problem, but very different and will require different types of help. Then, I would explain that and why their behavior is problematic and propose ways to improve the situation. If this has no effect, I would escalate to a mod-message, repeating the points and making clear the behavior must change or a suspension will ensue. If this still has no effect, I would go through with a suspension, making clear that they are still welcome but only if they address their behavior. On the way, I would exchange with fellow moderators, especially while I am new to the job, to be up-to-date with any back-story and other relevant information. First, I think it is a terrible idea for moderators to get into public open-close wars and alike. It not only gives a poor impression, it is also pointless. They have the same power, no-one can win. In the end they need to find an agreement anyway (or have SE-staff force it upon them). It's way better to find some agreement beforehand. Thus, I would try to find out why the other moderator took the action and explain why I disagree (if I still disagree after the explanation). Usually, we two should be able to find some common ground. If not we might involve other members of the team, and if all else fails maybe just do an internal vote to decide the course of action. The above applies to situations where I believe the other moderator made an actual moderator decision. If it is just a dupe-closure that I am sure was incorrect and based on an oversight, I might as well just undo and leave an explanatory comment (as if the original action was taken by a non-mod). First, I firmly believe in explaining moderator decisions preemptively. This can avoid conflicts. If this failed at some point, I will try to understand the point of view of the other party and also try to make my point of view clear. A moderator is not always right. It is perfectly possible for a moderator to misjudge something and there is a reason why the software allows the community to undo moderator closures. Thus, it may well happen somebody convinces me, and I might even undo my vote. Or I just let the normal process play out, I close, five others reopen, moving on. It's not a big deal if it happens occasionally, but it should not happen frequently. Let me be clear on this: for a site this large a well-working community-moderation by users is key. Being an activist moderator who is heavily involved in decisions the community can take for itself, such as open-close and alike, is detrimental to this. This is even the case when the moderators decisions have much community support and of course it is much worse if this is not the case. I do not intend to cast many votes. However, what I do not like is users objecting to moderators casting votes on principle. This goes too far. I am of the opinion that a moderator that is not willing to ever use the powers they got, is not quite fit for the job, either. I do intend to cast a few votes. One never can be sure, but I do not expect any major changes in my life in the next few years to come. I have a tenured position and do not plan to change it. It is true that I have a variety of commitments but since several years SE activity fits in nicely, and I see no reason why this would change drastically. I spend a lot of time in front of my computer. I am the type of user that checks numerous times a day for shorter periods of time, which is I think useful for a moderator. Janitor, in the broader sense of facility manager, captures most of it quite well. The job is mostly to make sure that others (the users) can go about their business without problems and distractions. Whatever gets in the way of this or is detrimental to this needs to be addressed. This also includes working out rules on how to use shared resources and conflict resolution (so the senator and peace keeping). At times it might also be needed to figure out who is at the root of some problem and this may require some detective skills, but that's not the main thing. And sometimes decisions need to be made, which touches upon the judge part. I prefer this over the umpire analogy, as the latter one suggests to me constant calls on minor issues, which I think is not what a moderator should mostly do. I believe strongly that users, also or maybe even especially, new and transient ones, should be treated with respect. We should not accept every type of question and we cannot help with every type of problem, but there is no need to be rude, snide and condescending in communicating this. In the other direction, I do not believe that we must tolerate every type of content or contribution, and if we don't this makes us oppressors, censors and what not. In brief, I think it is mostly about facility management, making sure that users can do what they need to do without problems, sprinkled with numerous other tasks. I have the badge on this site. Being a moderator on another site I am even familiar with all types of flags, and the mod-interface. The greatest strength is that this is by now a pretty huge and diverse gathering of people passionate about mathematics. I especially like the diversity of profiles, students, retired professors, professionals from other fields, independent researchers, etc. The greatest weakness is that over some differences of opinion different groups of users can tend to forget that there is much more that unites than that separates us. Yes. Uncertainty creates distrust and maybe even fear. To the extent possible, a moderator should be willing to explain and to justify their actions. I will try to do this, and it should come easy to me. This is the up-side of my penchant for discourse, if needed, I will go to great length to lay out my point of view. But, maybe this post is now long enough, and I stop here. Footnote 1: The question was raised on my nomination about the reasons and the context of my account deletion on MO. While I answered it in comments there let me also answer it here briefly. To leave in a clear yet clean and discreet way (at least this was my intent) I took some precautions (handing over a chat-room ownership and informing somebody about the action beforehand), and then simply asked SE to delete my account. Of course, as usual with account deletions, all my content there was kept in place, I did not delete anything (only some mostly spurious posts fell victim to the auto-delete script that is more aggressive to posts of deleted accounts). Could this also happen here? The policies and direction that mostly frustrated me are essentially not present here. In that sense, no. Of course, I cannot exclude that at some point in the distant future something will make me want to quit this site, and I think realistically nobody could exclude this for them. What I can assure you though is that if ever I decide to leave or just to stop moderating I will try my best to organize a clean hand-over and try to avoid friction. I have never been suspended. The worst I did is to take the passive-aggressive side in some discussions occurring in the comments space. It happened only occasionally and I believe the heat did not rise over the warning level. On the average, I am a very peaceful guy. No. I do not think I should "steal" from MSE valuable answers, and it is not my duty to compell with the moral code of the involved school/institution. Cheating is despicable and people prone to that should be aware (from the start) that their actions have consequences. I won't take the burden off from them. I believe in the power of numbers and words. From my point of view a discussion is always an option, so I would try to understand why such user is behaving in such a simultaneously constructive and destructive way, then try to convince him/her to improve his/her behaviour. We all are very complex people, we all deserve a chance to explain our reasons. If neither the first, nor the second nor the third discussion has any effect, it might be the case to switch from words to actions. The hypothetical level is now so high that I am not able to answer how in a more detailed way. It depends, case by case. On the other hand, if such situation really occur, I won't probably be the only one to ponder what to do, and I will have the chance to value other's opinions, too. From my perspective, the answer to this question is more or less the same to the previous question. There are spaces to discuss it, there is a time for changing one's beliefs, if stronger reasons come. Settling in a middle ground may be a good choice too, in real-life situations. Maybe it does not apply really well in this case, since there are not many intermediate states between open and closed, but still, as a general principle, I try not to be too fast in pulling the trigger. All right, my way to behave would be the same outlined in the previous answers. I would try to understand why, value my position, value the others position, come out with a peaceful resolution. :D Really? :D In the past few years, I believe to have spent at least two hours each day on MSE, with very few exceptions. I love to be here and I like to serve this community, it is just a matter of converting a certain amount of time I previously used for writing answers&questions in the right amount of time for my duties as a moderator (if elected). And I can still make some room, since, to be honest, I do not sleep really much. So, no problem at all. By the way, I live in Pisa, Italy, in the GMT+1 time zone, if it is relevant. I pick the peace force since I believe a peace force is essential in keeping this place polite and well-functioning. I pick the janitor since flag management may be a boring activity compared to spreading the knowledge through questions&answers, but it is essential as well, for the same reasons. And I pick the congressman since moderators have more power than the common users, and that is a heavy responsibility, to be carried with a large amount of good faith (in a ideal world, and MSE goes pretty close to being an ideal world). I have the Deputy badge and I think to be confident enough in flag management. I have to learn about using the moderators interface, but (again, if elected) I hope it will not be horribly difficult to handle. Without any doubt, the greatest strength of MSE is the possibility it grants to virtually anyone to acquire a fairly good level of mathematical knowledge, on-demand, for free. The possibility it grants to "teachers" like me to improve their communication skills, too. Then I have not a single concern, but a couple of them. For instance, the integrated search system still seems to handle $\LaTeX$ not so well. There were some interesting proposals on the table (I am talking about Approach0) but I honestly do not know if they still are on the table, or if they are really feasible. And I am concerned about the questions queue, since with an increasing amount of users, lovely questions might become too quick to catch, and the general activity a bit more dispersive. At last, the PSQs (problem statement questions) issue bothers me. From the introduction of the homework tag since its removal there has been no widespread consensus on the matter. I recall my position for users I never interacted with: I think that PSQs should not be closed-by-default. When facing a mildly interesting question, I think we should suggest the OP to improve it; when facing a really interesting question, we should ponder about leaving it as-it-is, since it might turn into a valuable piece of Mathematics through its answer only. Of course there is a huge grey area here, since the difference between mildly interesting and really interesting stands on a personal judgement, and if the volume of PSQs really becomes unbearable, a strict policy might turn into the only option. I would like to hear from the community, and I would like to enforce a shared vision on the issue, no matter if different from my original vision. In everyday's life, I love to be transparent about my ideas, my beliefs, my actions. I never retracted when asked why did you act this way?, and I intend to keep the same line here. Of course, there might be details which cannot or should not be disclosed for solid reasons. For instance: some resolution took by myself and other people. In such a case, even assuming the right to privacy of a third party is not involved, I feel free to only share my contribution to the discussion, if the other people agree about that. Probably, this hypothetical situation belongs to the complement of whenever possible. I have never been suspended. I'm not sure exactly why this is a question, I can't imagine any reasonable candidate saying they would delete the question. Math.SE is bigger than any individual user. It is not fair to delete content (especially answers that DON'T belong to the original poster), robbing other users. I guess I can use this question to make a broader point about "homework questions". It is not our role to play investigator into offsite matters, such as whether a problem is homework or not. I would prefer students don't cheat of course and as a professional educator, I do my best to catch students in my class. However on math.SE it is simple untenable to play academic police. What people object to isn't necessarily "homework questions" but homework style questions, with no accompanying context. I have asked questions on here about homework problems (always with context). I think www.physicsforums.com does do this correctly. They emphasize that "homework problem" is really shorthand for "homework style problem". I think math.SE should adopt (officially or unofficially) such a policy. As a moderator, I would try to discuss things with such a user and remind them of our be nice policy. I would try to figure out why they were so argumentative and try to find a peaceful resolution. If that is not possible, and they continue to cause problems, rules apply to them too. I would take whatever measures I would take with anyone else; high rep or not. As always, the answer is communication. I would discuss with them why they did such a thing. I would like to think that most other mods are reasonable and wouldn't close/delete a question for no good reason. Even if they have different reasoning than me, I would prefer to not think that it was completely arbitrary. In the very rare case that we couldn't come to a conclusion, I would perhaps confer with other mods. If other mods disagree with me, I would just let it be. The site is way bigger than one individual question. Same answer as the previous two questions: communication. I would discuss the issue with the person who disagreed and try to explain my actions, and listen to them. I'd like to think that most people are reasonable and wouldn't disagree for no reason. If we couldn't find a resolution, then I would discuss with other moderators, preferably more senior mods to find the right course of action. However, I do anticipate that I could make a decision that someone disagrees with and we can't find a resolution. If the other moderators agree with my decision, I would let it stand. I would do what I think is best for the community, and what the community wants. Sometimes that's not what a particular individual wants. I have been on here for 936 consecutive days as of writing this. I joined when I was between undergrad and grad school when I had a ton of free time, and now that I am in grad school I have less time of course. But I am still here everyday. I am addicted to this site. I don't have any major changes in commitments coming up, I am still on this site for at least 30 minutes-hour each day, sometimes a lot more. I don't anticipate this changing anytime soon. I expect to stay on here as much as I have been for the foreseeable future. I think a moderator is primarily a janitor. Lets be honest here, there is garbage on this site. A lot of garbage. Terrible questions, terrible answers, terrible comments, terrible everything. There is a never ending flood of pure garbage. As a regular user, I close/delete/downvote garbage to get rid of it. As a diamond mod, I would be able to remove so much more garbage much more efficiently. Secondarily, I see mods as a peacekeeper. However this is basically a glorified janitor. Heated arguments are just another form of garbage, they rarely if ever contribute anything, and if they do contribute the same result could have been achieved by being nice. If I can use communication to stop heated arguments, and remove some current/potential garbage that is just as effective as using other tools. I have the deputy badge. As a matter of fact, as of now I have 1,096 successful flags. This goes back to question 7. The greatest weakness of math.SE is the garbage. Terrible questions, answers, comments, heated arguments, etc. All the awful things we see. The best thing about math.SE is everything else! I love math.SE and am addicted. I love reading the wonderful answers from many brilliant mathematicians. I love helping out inquisitive students. I love the ability to practice my problem solving and pedagogical skills. There are many things I love about the site, but what makes math.SE so unique is the community aspect. Everything is democratically decided. Usefulness of answers, of questions, even moderators are decided by the community. This is unique to math.SE, I haven't really found a site with this strong of a community aspect. I like that anyone with a computer and interest in math can come on here and learn, teach and discuss mathematics. Math.SE is egalitarian and meritocratic in this sense, and that is what really makes math.SE stand out. As I said above, communication is very important. From a purely practical point of view, it is not necessary/possible to explain every little thing you do. But I would definitely try to explain myself if anyone asked questions as a diamond moderator. It is my duty to the community. There are of course extreme cases where it might not be possible to explain your actions, even if a user wanted an explanation. However I don't anticipate this happening much, if ever. I would like to think that most actions would not fall into one of these extreme cases. No, I have never suffered any such suspension from any SE site. I am an active member on many SE sites; Physics, Chemistry, Stack Overflow, Chess, Music Theory, Academia- just to name a few. But I have never gone against the site rules to get suspended. The maximum I remember, is getting into a few disputes with fellow users, regarding questions and answers on MSE as well as PhySE, which we finally cleared up like mature adults. A straight NO. If the answers contribute something really good to the question asked (provided the question asked is not extremely silly, hence getting showered by downvotes- then I might close it down), it will serve to enrich the community. Interests of particular individuals is not what a mod is supposed to look at. The concerned user must be mature enough to realise the consequences of asking questions, which are part of assignments, homework etc. which might be deemed as "cheating" in the concerned user's school/college/institution. At best, the user might change username and delete his account to shrug off responsibility from asking the question. But, as a mod, it will be my duty to keep high quality educational material inside the community. Well, valuable answers are always appreciated and praised by words and upvotes but, at the end of the day, this is a community of, for and by the people. If one person constantly argues with people unnecessarily and puts offensive words in his/her comments, thereby disturbing other users, that person will be warned about his/her poor behaviour. And on further repetition, his/her account will be put on suspension. However, there are 2 sides to a coin- more than often, one does not argue disruptively until and unless that person has been instigated by some other person(s). I will then have to judge from the comments made, whose fault it was. And warn all the concerned people in accordance to their behaviour; because irrespective of whether you are instigated or not, you must not offend anyone, rather you should flag the concerned comment and ask the mod for help. I agree, that while answering a question, even though a mathematical one, there may be difference of opinion. That is what is expected of the users- Rationalism. The Chat option is there for this reason. But if that discussion turns into a noisy or foul argument, it is bad for the community and appropriate action must be taken. A good example of such a case is Ron Maimon. Maybe, I would discuss that with the concerned mod and come to a meaningful conclusion. This is a question whose answer depends upon a particular situation. In some cases, I might finally agree with my fellow mod's closure decision; in some cases, my fellow mod might feel that my opinion has a strong point. Well, in all cases, it is recommended that peace is maintained. I generally tend to remain calm in these situations. Everyone has his/her own opinion and is allowed to express it, provided it is constructive and non-offensive. I also have my opinion and if elected to be a mod, I will have some special powers entitled to me, just like my fellow mods. And what the majority of the mods will decide, is what is going to happen. I being a member of this community, believe in the way MSE is moderated as an open science platform. And I believe in that structure and ready to abide by it. Well, I too have my commitments. But this is not like a commitment. Its more like a part of my life. Everyday, I visit MSE at least 15-20 times a day in search of good questions (on the App, however). Any free time, I get; I promise to devote it to MSE and my fellow mods will be there too; and I believe that they will also help me in doing my job. 40% judge/referee (deciding if a question should be kept/closed/deleted, checking if any abuse is going on in the comments section), 40% janitor (cleaning junk and making this community a better place) and 20% UN Blue Beret (checking if there is any dispute and warning users accordingly, trying to keep this place calm by taking appropriate actions against offenders). I have the Deputy Badge and I am confident that I can deal with flags properly and efficiently, if elected moderator. There are many, on both sides, but I can't recall all. The greatest strength is undoubtedly, the huge database of Q&A's that MSE presents. Alongwith MathOverflow, MSE has the answer to almost the majority of discussed math questions. I don't remember a single topic in math that when asked on google doesnt produce a MSE result. Again, the greatest weakness, I believe, is the in-built search functionality. It is quite weak. You search for some question here and you get a poor set of results. Ask it on google and you get a better set of results. (Of course, the comparison is meaningless, Google is famous for the search engine). However, mention must be made of Approach0, a quite decent search engine for this math site; and thanks to Simply Beautiful Art for finding it. Obviously. Just like the political leaders, they are also elected by the users and hence, users have the right to ask what action the mod is taking in a certain case and why (except certain delicate issues involving internal analytics). However, it is not always necessary for a mod to explain his/her actions since the users voted that person due to the fact that they trusted him/her to make good decisions. No, I've never been suspended. From my experience in the math mod office/chat room, I think the usual approach would involve making the question a community wiki or something to that effect with a deletion of the user's account. React on the same scale as I would anyone else. Just because a user has valuable content does not give them more rights than another user. I think my immediate reaction would be to try and sit down and 'talk' to this user, make them aware of the possible trouble they may be in, try to understand their side of the story, etc. I would consult the other moderators to gain a consensus on what action seems best for the scenario and act accordingly. We all make mistakes, and we don't all see things eye to eye, but I'm certainly willing to follow the majority judgement of the moderator table. I would consult the other moderators and allow the majority consensus ruling to be enforced, regardless of what I think of the matter. After all, my judgement isn't perfect, and I'm still human. If life keeps floating at its current rate, I'm fairly certain I will be able to manage at least 2 hours per most days on this site. On the average weekend, we can go with "I'm basically online from morning to sunset", unless I have other plans. I see myself most as a janitor and police officer since I spend a lot of time going through posts and reviewing them, and occasionally trying to enforce the sorts of policies I'd like this site to have. This is a question to those candidates who do not have the Deputy badge (which is given for 80 helpful flags). Dealing with flags is a big part of moderation. How do you think that your lack of experience is going to effect your handling of the flags? And how do you expect to compensate for it (at first, of course)? I have the deputy badge, as of Sep 2, 2017. As another note, I'd like to mention that I do check my flag summary and try to adjust my flagging behaviors appropriately. I believe that MSE's greatest strength lies in its database. This is the place I go to to find information about certain math problems, sometimes to cite myself, or find links to information elsewhere. Overall, MSE is the largest and broadest collection of mathematics I'll probably ever see. I believe that MSE's greatest weakness is its never ending flow of new users. I can understand that many do not care to read about site policies and all of that mess, and I will admit that when I first started out, I was just the same. However, the problem arises when they blatantly refuse anything other than answers, and ask for more help than what the hints provide without elaborating on what they've tried to do with the hints, vandalize their question by editing it with "e wuipfhwe hfwe a", and/or repeatedly post low-quality posts that get closed and in some cases deleted. Not entirely sure I understand what transparency means, but anyways... Some moderator actions should, in my opinion, be very much public. This helps the site make sure the moderators aren't doing anything bad :-) Of course, some actions are best left invisible to the public, but I do not believe all should. 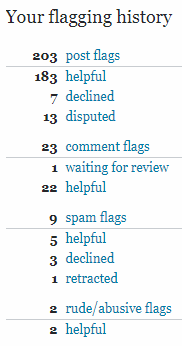 My flagging history (on MathOverflow) (all the flags were found helpful): 9 post flags, 1 comment flag, 14 spam flags, 8 rude/abusive flags. No, I think the moderators are in agreement not to do this. I guess I would discuss with other moderators, possibly with the user or with StackExchange staff. I guess there is always the possibility of a temporary ban. If it seemed very unreasonable to me I would probably discuss it with the other moderator; if only borderline I'd just let it go. I'd certainly be open to discussing it with the user and with other moderators. I've been active on MathOverflow and will be able to keep a similar level of activity. Also I'm probably in a different time zone from the other moderators (Hawaii). Maybe Senator? To be honest I may not be one of the most active moderators, I'm more interested in ideas for the future of the site, but I would do a reasonable amount. Never, I'm a calm person especially on the internet where you can always take a few seconds to cool down if needed. The priority would be to preserve answers, the first attempt would be to delete all the personal information from the post, if the OP needs to remove his name from the post (disown it) I could temporarily delete and lock the question until administrators remove his name. However I can't imagine a case where someone would urgently need a question deleted so in most cases I would just delete the personal info from the post, explain the OP that he can ask for his question to be disowned and let the question be. If someone is straight insulting I would have to be a little stricter, at first I would try to talk with the user, if nothing constructive comes from it and the user doesn't want to change I would notify the other moderators of the conversation I had with him, next time I would officially warn him, if he continues and others moderators agree he will get suspended. For cases when the user is being rude but not straight offensive I would give more slack because such behavior is easier to correct and it does considerably less harm so perhaps something along the lines talking few times, and perhaps few warnings and then perhaps a suspension. We're all humans, we make mistakes, it's likely that I being a newbie moderator am missing something. Clearly I would talk with him about the question in private, if we both feel strongly and have contradicting opinions, I would ask the moderator at hand if he minds that we ask other moderators for opinions on the question. I'll accept whatever we agree upon. Moderators along with other duties are here to make sure that community made rules are uphold, if my decision was to delete unarguably offensive or bluntly off-topic questions I would explain the user that this is the policy of this site and that he can suggest a change in policy on Meta. On cases where I'm not 100% sure that my decision is the right one I would lock the question to try to deescalate conflict and suggest users take the issue to our meta site. Unless I myself see that I've made a bad decision at which I would apologize and reopen/undelete etc. It's impossible to assure such a thing since life is unpredictable however out of 3 years and 7 months I've been a member I visited the site 952 day. So far I didn't have problems with keeping up at school and university and being active on this site. Senator - $0$% because I'm not here to make policies but to apply them when needed. Detective - $10$% for hunting down vote frauds and people evading their bans. Janitor - $40$% to clean up and fix things that only moderators can. Referee - $20$%, $5$% for cases which need immediate judgement and $15$% for having to consult other judges for the final decision. I do have the Deputy badge, however I feel there is much more to handling flags then there is to flagging though I don't doubt that over time it will be easier. The greatest strength and weakness of MSE is that it is a huge community, huge community brings a lot of different users with different backgrounds which brings interesting questions and answers, also most question are answered quickly, and users also moderate the community usually nicely. Which brings as to the problem: the community is often inconsistent about what questions should be closed, some good questions get received as bad and get closed, while some bad questions don't get closed and have good answers. Unfortunately there isn't much moderators can do about that. No, never! On any site, not only Stackexchange. Generally no. It shouldn't be a matter of cheating, because according to the policy om math.sx typical homework questions are rarely fully answered. If s/he has enough reputation, s/he can reformulate the question to avoid a simple search. And last but not least: questions and answers are for the community. It depends. I cannot be in someone's mind, but the initial assumption should be, that it is not done intentionally. Probably everyone of us knows mathematicians who are so far away from the real world, that their behaviour is atypical. If only I could see a good will, my role would be to preserve others from such a behaviour. I can delete some words or comments, but it should be only action for some time. Even if a bad behaviour seems to be intentional, there is always time for explanation. On tex.sx I have >25k reputation, so I can see many facts. Once a person gave a series of rude comments. I flagged them immediately. They were hidden. And a short time later he apologized for the situation, claiming that somebody made a stupid joke from his account. How can behave a pupil? He should learn, following the masters. People can talk. People can discuss. I am a human. I am here near every day. Two times a year I can have huge exams, where I am lost to the world for, say, three days. This time is easy to predict. Something between a janitor and a cleaner. I have no right to judge, I can only serve. I have a Deputy badge on tex.sx, so I have some experience. I can see some differences in behaviour on math.sx and tex.sx, but I do not think, that they induce a lack of experience. All StackExchange seems to be one of most imortant pages helping people. On math.sx answers for typical questions are near immediate. The policy of closing questions is much more unpleasant for beginners than its version on tex.sx. I think, that some elements, e.g., leaving enough time for correcting an answer, might make this page more friendly. I think that moderators have good, trained for a long time rules, and following them is the better policy. I do not know, what happens hidden to eyes of ordinary users, so I cannot decide, which version is better. I hope however that there is near nothing to hide. It should be ideally NO and I support that no.We at SE have our own set of rules,policies and commitments.It is not that we are going to bend and be flexible always about our rules for the benefit of other organisations.However we may try to protect the privacy of OP to the maximum possible extent.How ever we do appreciate high quality questions and would always like to preserve them. We should abide by a strict set of rules and conduct and make others aware of the policies binding on them.Also, we don't support cheating and other misuse of this great facility. Behavior should be always be the first priority. We appreciate contribution of our fellow members.However we also expect as part of the team upkeeping the site that there will always be a healthy environment round here. I believe that most issues should be solvable with proper discussion with the accused user maybe through an official thread.If situation so demands,suspension of account may have to done to prevent future misconduct. A fruitful discussion is always the best method.Most of the other mods around here are senior to me.So,I think we would like to understand why a particular conclusion is made and come to a common consensus that would further strengthen our relationship as a team. 5.What would you do if someone opposes a decision you've made? For example, opposition to removing some comments, closing/reopening/deleting a post, etc. Such opposition may come from direct comments or votes to reopen a question closed by a mod, etc. Taking opposition positively is a great trait for a leader. So,I think that we must be tolerable and try to listen to others as opinion and not as an opposition.People may not always be of the same opinion but we always have the chance to uphold our thoughts with proper evidence and convince others.This should lead to a solution. 6.Most users here have multiple commitments. And likely, those commitments aren't going to go away if you are elected to be a moderator on MSE. Can you provide any assurance that you'll make the time, as needed, to moderate on MSE? This may only amount to an hour each day, consistently (perhaps more on some days, and less on others). In any case, how can you assure us you're not biting off more than you can chew? Good question.However until now,we see only 7 nominations for moderators out of a total of 4,622 users with 1k+ rep who are eligible to participate.So, this shows that only responsible people have taken up the opportunity to participate in this and not randomly walked into a park. On my part I assure that I am a fully willing to take up a responsibility here. I have 47 helpful flags.I am pretty confident to cross the 80 mark soon.I am looking forward to work. I may be treated as a newbie due to low number of flags but I may be given an opportunity to showcase my moderation skills. Strength- Obviously the vibrant community which includes mathematics enthusiasts from a school child to author of textbooks and those with higher education in advanced math topics.This helps everyone to get a glimpse the vast world of mathematics and maybe get more exposure to a wide range of topics. Also,we have a vast repository questions. Also,this is perhaps the only website of its kind that is so well organised. There are few other sites for a similar purpose but none of them is as attractive and as well organised as this one. Weakness-Nothing in particular.But PSQs and low quality questions from new users are a big issue.Also closing of questions sometimes becomes controversial. Many not so good questions are not closed while many good questions tend to be closed. This is because the not so good questions are not paid much attention and add up to the total junk. Yeah.There should be always a democratic method. Mods are working not like dictators but they are responsible fellows who actively want to make the site a better place.So,they must cooperate as much as possible with other users.Transparency is necessary as it helps to build up trust between users and mod team. This ensures friendly relationship between all which ensures better outcomes.